The journey from cocoa bean on a farm to chocolatier to delicious chocolate is a fascinating one. The cocoa tree is an unusual tree to start with, it’s what’s called an ‘understory tree’ which means it has to grow in the shade of other trees. Because it becomes 50 feet tall, and it requires trees of 200 feet to shade it, cocoa plantations are large places! Secondly, cocoa trees are demanding plants: they insist on perpetual warmth and humidity, shade from the tropical sun and protection from the wind. On the other hand, a happy tree can produce fruit for up to a century, so getting the plantation right can mean a long productive life. 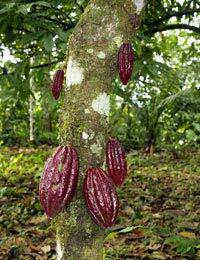 Cocoa beans are first produced by a tree that is three to five years old. Minute pink or white flowers growing along the main branches of the tree have to be pollinated either by tiny flies or by hand. The farmer climbs his tree with a brush and moves the pollen from one flower to the other. Pollinated flowers become football-shaped pods containing the cocoa beans. Collecting the ripe pods is labour intensive – knives on long sticks are used to cut through the stem of the pod, which is then collected and piled up to be split. The beans are covered in a sticky white pulp when they are removed from the pod and left to dry in the sun, after which they are put in sacks and taken to be processed. At this point the cocoa bean may undergo one of two treatments: chocolate manufacturers tend to roast the beans before shelling them, but cocoa manufacturers shell the beans, then nib-roast them. In either case, the nib is then ground into a paste or slurry – grinding melts out the cocoa butter in the nib and the resulting product is called cocoa liquor. Again, the liquor may undergo a number of treatments depending on its eventual use, but it ends up being a rich fatty cake that is predominantly cocoa butter. Milk chocolate has added fresh or powdered milk, and sugar. White chocolate is predominantly cocoa butter without solids to darken it, and has added sugar and vanilla to give it a sweet taste. After this, the blended chocolate is placed in conches which are drums with huge paddles that stir the mixture under gentle heat, and extra cocoa butter may be added. The longer chocolate is conched, the smoother it becomes and so this process can take anything from a couple of hours to several days. After conching the liquid chocolate may be placed in vats and shipped to confectioners and dairies or it may be moulded into blocks for sale in the same way. At the chocolatier’s the chocolate will be tempered – it’s melted by being heated to a specific temperature, then it’s worked with a machine that kneads it as it cools, or it may even be hand-kneaded. In either case, more heated chocolate is added and the kneading is repeated. This produces a glossy, flexible chocolate base that can be used to make a range of chocolate materials such as truffles, enrobing chocolate and blocks and bars.